Toronto Police CAUGHT IN BLAST: Dramatic video footage released by police shows the moment an unknown set a car on fire in the O'Connor-St. Clair area. Toronto police are seeking an arsonist shown in dramatic security camera footage setting a car on fire near O’Connor Drive and St. Clair Avenue East early on Dec. 29. The unidentified man may have been injured in the arson attempt, police say, as the video shows the hooded figure briefly engulfed in the blast. Toronto PoliceESCAPE: Man who set car alight is shown in video recoiling from the fire and fleeing. He is shown quickly recoiling from the fire and immediately fleeing the scene. Police report they responded to a call for a vehicle on fire at about 5:15 a.m. The car was parked in the driveway of a home. 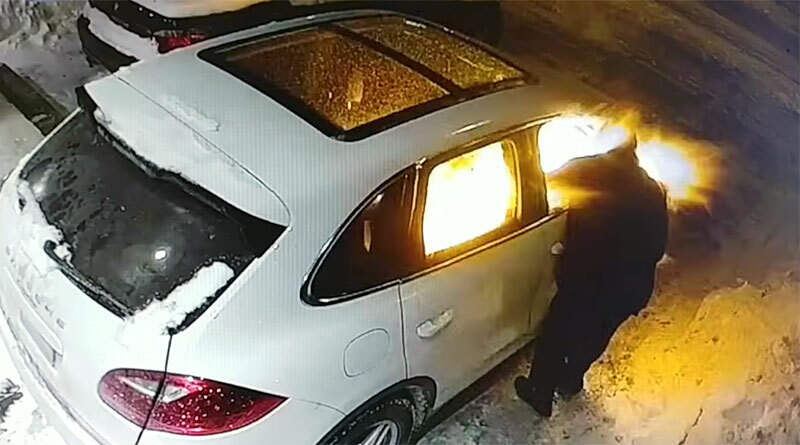 Video released by police on Jan. 2 showed a man, whose face could not be seen, approaching the car, smashing a window, dousing the inside with gasoline and setting it on fire. The man reportedly fled the area in a white, four-door sedan. He is described as wearing a dark jacket, gloves and black boots and may have sustained significant injuries.